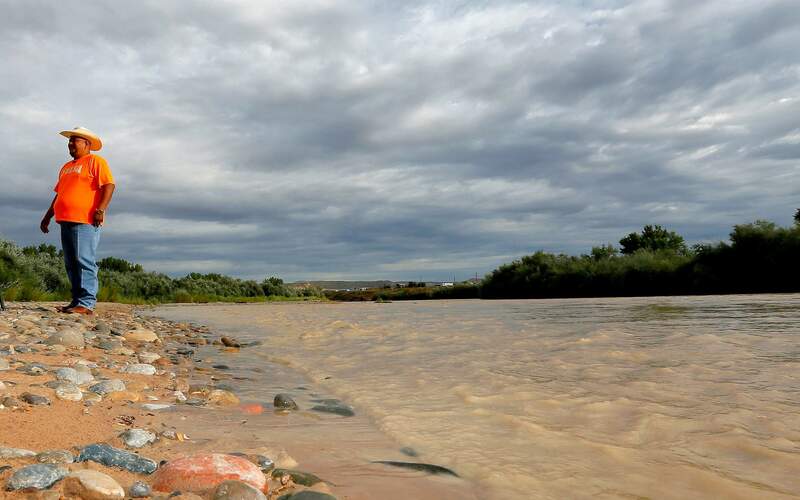 Navajo Nation Council Delegate Davis Filfred walks along the San Juan River on Aug. 11, 2015, in Montezuma Creek, Utah, as tainted water from Gold King Mine spill is visible. The Environmental Protect Agency filed a motion Thursday to dismiss a lawsuit filed by tribal members seeking compensation from the spill. The U.S. Department of Justice, on behalf of the Environmental Protection Agency, has asked that a federal court dismiss a lawsuit filed by members of the Navajo Nation seeking repayment of damages associated with the 2015 Gold King Mine spill. For more than three years, those affected by the mine blowout have been awaiting compensation for damages they sustained in the spill, which was triggered while the EPA was cleaning up the site north of Silverton. The spill dumped 3 million gallons of mine wastewater laced with potentially toxic metals into the Animas and San Juan rivers, affecting three states (Colorado, Utah and New Mexico) and two Native American tribes (Navajo Nation and Southern Ute Indian Tribe). The motion filed Thursday argues the same point in seeking to dismiss a lawsuit that represents about 300 individual members of the Navajo Nation who claim a cumulative of $75 million in damages. “What’s noteworthy is that these Navajo folks are exactly the people the EPA took responsibility for harming,” said Katherine Ferlic, an attorney representing the tribal members. Ferlic works with Egolf, Ferlic & Harwood, a Santa Fe-based law firm. “And now, instead of answering the complaint and taking responsibility, they (the EPA) are trying to use a legal loophole to get these claims dismissed,” she said. With the plugging of the American Tunnel, many researchers and experts of the mine district around Silverton believe the waters of the Sunnyside Mine pool backed up, causing the Gold King Mine to discharge mine wastewater. The problem became such an issue that in 2014, the EPA was asked to step in. It was the next year that contract crews dug too far into the collapsed portal of the Gold King Mine, triggering a blowout on Aug. 5. The lawsuit on behalf of Navajo members says the spill, which carried arsenic and lead, prevented them from using water for their crops and care for their animals, as well as personal use. Attempts to reach EPA officials late Friday were unsuccessful.